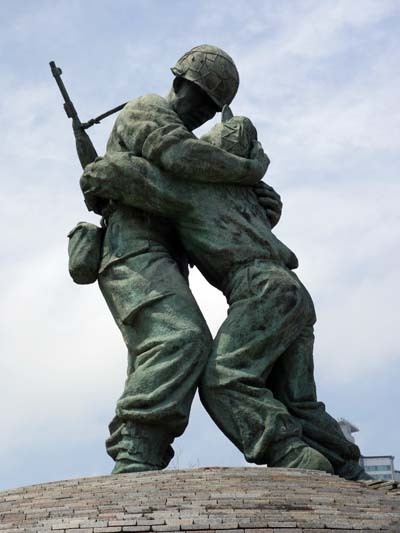 The Two Brothers statue stands outside the memorial. It is a rather sentimental representation of reunification what is often called the ‘fratricidal war’. A tall South Korean soldier, weapon on his back, clasps a smaller drooping, supplicating North Korean. They are brothers reunited on the battlefield, standing above a fractured hemisphere representing Korea. It is said to be a real story, but no one has the names, or any details of where the brothers met, or what happened to them. The statue symbolises what many Koreans – especially the thousands of families who still have relatives in the north – reunification. It could be that the reunification they want is at the family level. Many Koreans, especially the K-pop gangnam-style generation, without a family connection would be happy if North Korea just went away.